Some people lift huge weights. Some people pull trains with their teeth. And then there's this guy. Need a tow? The man's eyelids get to work on the van! But that's exactly what this martial arts enthusiast is doing, as he pulls the vehicle along with a rope connected to his eye sockets. The demonstration of his eyes' pulling power happened during a performance in Hefei, in China's Anhui province. It's not entirely clear how far he managed to pull the van, or how his eyes felt about the whole affair. 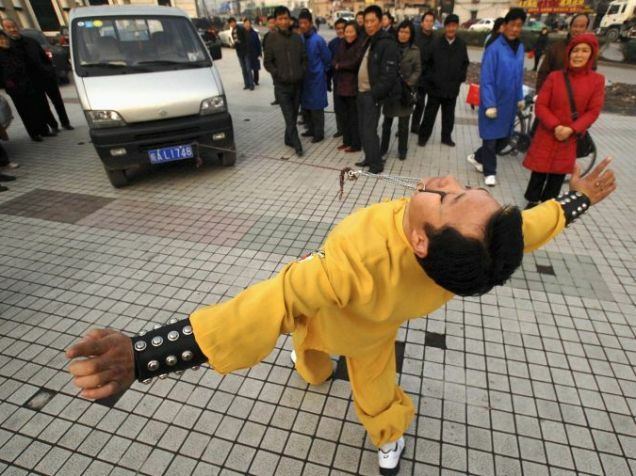 See a list of the Top Five Weirdest Painful Stunts here.